A traveler going north of Laoag would not miss them by any chance. From a distance, they are like white three-horned giant robots guarding the seashore. For others, they seem white monuments, rising to the sky, in all their glory. But for the province of Ilocos Norte, they are mighty giants in tourism and renewable energy. They are the Windmills in the town of Bangui, the first wind power plant in the country and Southeast Asia, which set the trend in the development of renewable energy this side of the world. The traveler can count 20 windmills standing by the Bangui Bay. This flagship project of the NorthWind Power Development Corporation initially consisted of 15 Vesta wind turbines generated 24.74 megawatts and completed on May 7, 2005. Another 5 wind turbines were later added increasing the plant’s total generating capacity to 33MW. Support facilities included the 5.7km 69kV transmission line from the plant to Laoag City and the 30MVA 13.8/69kV substation. The Bangui wind farm is a response to the government’s call for the development of renewable energy sources. Dubbed ‘clean and green’ it is a milestone that jump-started the initiative of the government for energy projects across the country to cut down dependence on existing generating systems using imported fossil fuels. The use of and emissions from fossil fuels, scientists proved, have catastrophic effects to the environment which largely contributed to climate change. In a couple of years, however, the traveler will be counting more windmills. That is because Governor Imee Marcos, in the second quarter of the year, announced that three more wind power developers were given the go signal to build five more power plants this year, all not far from Bangui. Energy Development Corporation will operate a $310 million 86MW facility in the town of Burgos while Energy Logistics will put up its plant also in Burgos and another in Pasuquin town with a capacity of 120MW costing $380 million. 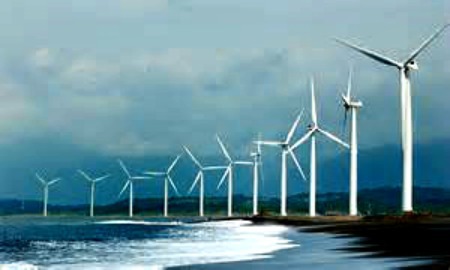 UPC Renewables will also build a 50-MW wind farm in Pagudpud, the northernmost town of Ilocos Norte. “We break our dependence on fossil fuels and within the next few years, we must generate 50 percent of the energy used by the province from renewable energies,” Governor Marcos said. Investors and developers of renewable energy have become interested in investing in the country following the passage of RA 9513 or the Renewable Energy Act of 2008 which gives incentives to foreign and local developers, suppliers and end-users of renewable energy. The ordinary tourist, however, may not be fully aware of, or particularly interested in, the technical and economic benefits of the Bangui wind farm, how it supplies 40 percent of the entire province’s electricity thru its connection to the Luzon Grid delivering power via Transco Laoag and reaches households via the Ilocos Norte Electric Cooperative. It is because the 20 wind mills immediately captivate the eye – an aesthetic feast, a testament to the wonder of nature combined with the genius of man. One of Ilocos Norte’s most famous images, the Bangui windmills have attracted hundreds of thousands of tourists. It made Ilocos Norte one of the top 10 tourist destinations in the country. Data from the Department of Tourism showed that tourist arrivals in the province in 2010 numbered 191,300 while arrivals for the first quarter this year have reached nearly 50,000. During the summer months, particularly during Holy Week, thousands of tourists walk the strip of the Bangui Bay foreshores under the gigantic windmills. One might feel rather so tiny under each turbine that stands 70 meters each, each blade measuring 41 meters in length or a total diameter of 82 meters. Due to the influx of tourists to the wind farm, livelihood entrepreneurs have mushroomed. Many houses sell garlic and onions, straight from their farms. The more enterprising and skilled ones make wooden replicas of the windmill, complete with rotating blades, pebbles and seashells. Manang Cely, one of the vendors of these replicas, said tourists go gaga over the miniature replica of the windmills. “They want it as souvenir for themselves or as gifts to friends,” she said in the local dialect. During peak season, Cely said, they can sell as many as 100 of these replicas in a day. The smallest sells for three for a hundred; fifty pesos for the medium size; and one hundred for the one-foot tall replica. “This has helped us augment our income from farming. We use the additional money for other expenses such as for education of our children and food” she said.